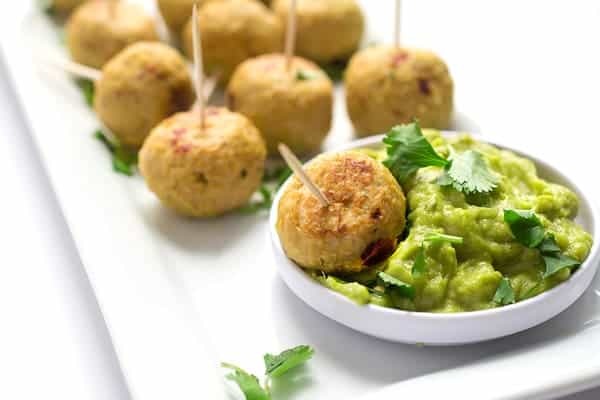 These tender baked turkey meatballs are made with fresh guacamole and smoky chipotle peppers in adobo sauce. Everyone loves meat on a stick.. you guys made that loud and clear when I recently shared my Thai Beef Satay Skewers! Well guess what? I’ve got more for you this week with these tender and addictive five ingredient baked turkey meatballs! Made with lean ground turkey, fresh Sabra guacamole, chipotle peppers and garlic… three of these baked meatballs are just 99 calories! Who said game day snacking can’t be healthy? Which leads me to our week 5 challenge of the Healthy New Year Six-Week Challenge: Healthy Game Day Snacking! As a reminder, in week 1 we covered protein-packed breakfasts, week 2 was all about ethnic eats, in week 3 we challenged you to use a new type of protein and in week 4 we used lemon to reduce sodium. The good news? It’s not too late to join the Healthy New Year Six-Week Challenge! Head on over to our Healthy New Year 6-Week Challenge Facebook page today and join the close to 1,000 who have already committed to healthier living. Be sure to tag myself (@TheLemonBowl) and Dara (@CookinCanuck) on social media along with #HealthyNewYear so we can rally behind you! 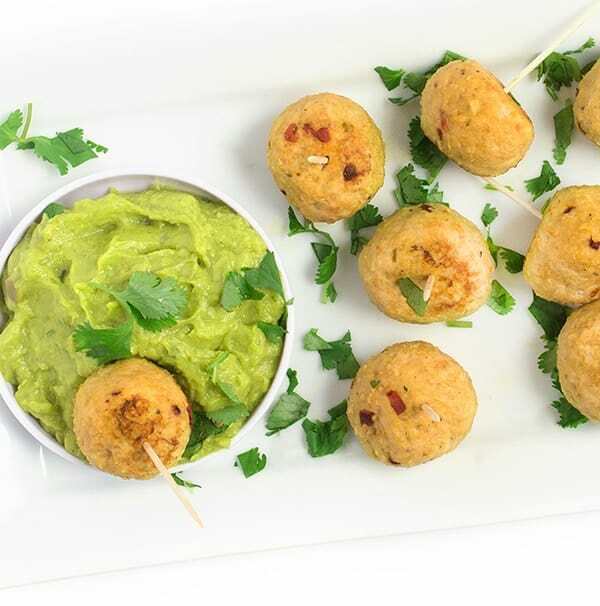 In the meantime, the next time you’re at the store grab a container of Sabra’s guacamole and try using it as an ingredient in your next batch of meatballs. The healthy fats in the avocados keep the lean turkey from drying out without having to fry them in oil. Made with fresh garlic, onions and lime juice, the meatballs come out juicy and delicious every single time. Pre-heat oven to 350 degrees and line baking sheet with foil. Spray with cooking spray and set aside. In a large bowl, mix together all ingredients: ground turkey through salt. 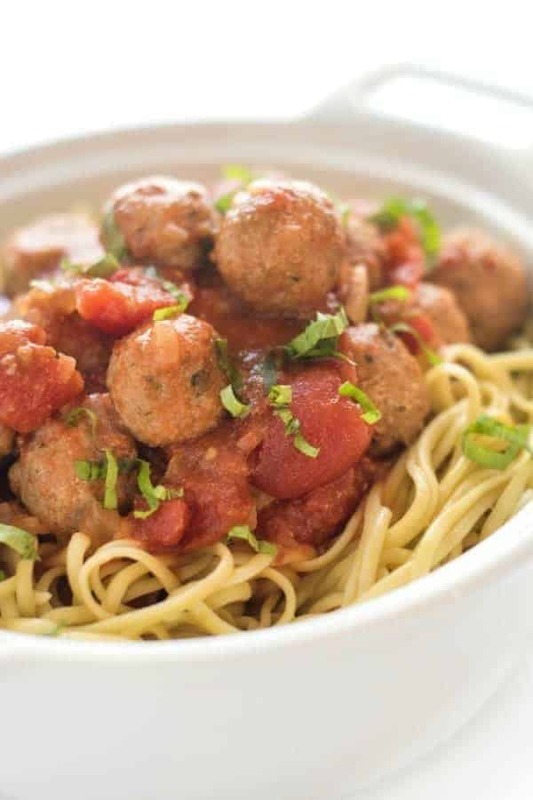 Using a small cookie scoop or a tablespoon, form meatballs and place in a single layer on baking sheet. Bake until golden browned, about 30 minutes, flipping once halfway through the cooking time. 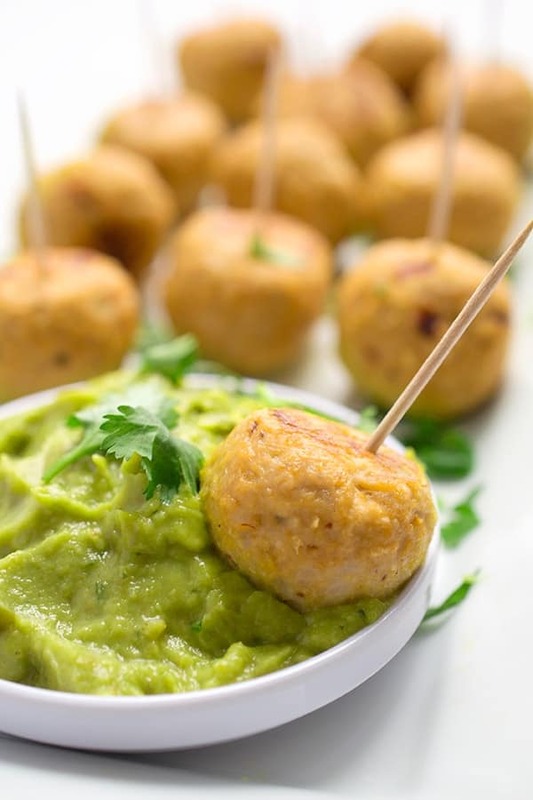 Serve meatballs on a platter with toothpicks and extra guacamole for dipping. Disclosure: We are honored to have Sabra as a sponsor of this week’s #HealthyNewYear challenge. Thank you for supporting the brands that make The Lemon Bowl possible. All thoughts are my own. 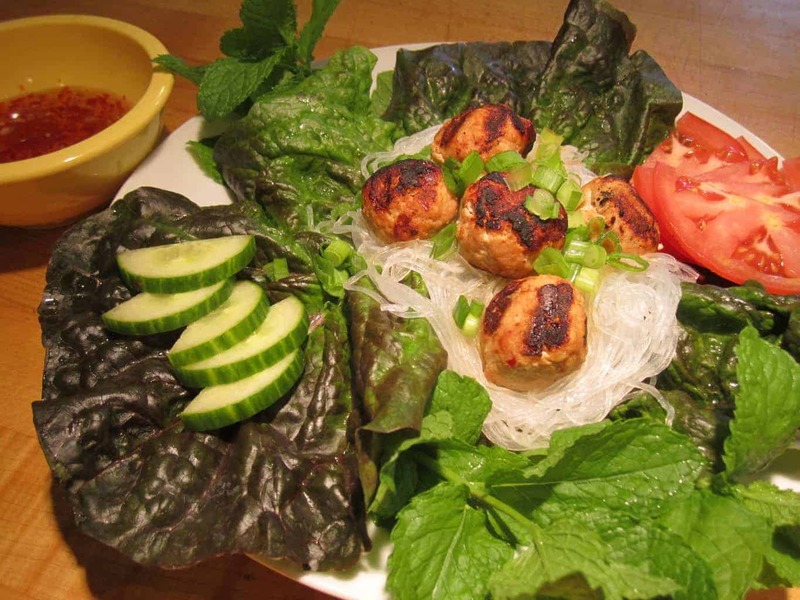 You can find more Healthy and Easy Dinner Ideas on my Pinterest page! Easy to make? Yes! However, the flavor is kind of bland. I’m not much of a “heat” person, so adding more chipotles is not an alternative to vamp up the flavor. Over all, I didn’t care for them, but my mother enjoyed them. Hi Kathryn – I’m sorry you didn’t enjoy these. We have made these several times and they are always devoured so I guess it’s just a matter of taste. That said we like them nice and smoky so we use lots of chipotle peppers. Did you use Sabra guacamole in the preparation? Do I need to make these? The answer to that would be, “Heck yeah!” Love this healthy idea for Super Bowl snacking. Heck yea is right sista!! I think you know how how much I love this! I need to re up on my guac game asap. Especially for this weekend! Yes girl it’s ideal for this weekend!!! Love that you added guac to the meatballs. GENIUS!! And extra for dipping? That’s my love language right there! Turkey is so lean so the guac was ideal for keeping them tender and delish!! 5 Ingredients?! Now we’re talking! These look delicious too! Happy Tuesday to ya! These look amazing as an appetizer, but I would make a meal of these! Yummy! I mean seriously – I could have eaten the entire platter! Why are foods on toothpicks so fun?! These look awesome! I mean seriously – lol!! It’s so true though! These look like something everyone in my family would enjoy. I’m so glad to see they are naturally gluten-free! Yay! Can’t wait to make them! Thank you so much! They were so easy too! Okay, so these look amazing and totally perfect for football! And you’re right…I do love meat on a stick! hahah I mean what is it about meat on a stick that’s so damn good?! If you need me, I’ll be in the corner with a large plate of these!! OMG!!! hahahaha I heart you!!!! PS: Is it April yet? Looks so easy and a great way to enjoy guac without the chips! Three cheers to that sista!